After our noisy night in Gruinard Bay we were on our way north stopping briefly in Ullapool to buy groceries. On a long trip in remote places a supermarket is like an oasis. Getting excited about a good selection of fresh fruit and vegetables we found ourselves reflecting on the fact that back in the 70s we would have been quite content with a few tins of peas. Our eating habits and expectations have changed a lot over the years. Leaving the supermarket we may have become the only sober people alive who have managed to get lost in Ullapool. We almost found ourselves on a ferry to the Isle of Lewis but slipped out of the ferry lanes just in time and got out onto the open road again. Up through yet more magnificent mountains we went – the oohs and aahs having now become chunks of silence as we try to take in the magnificent beauty of this fabulous country. Along the way we stopped for lunch in a remote layby on a mountainside and saw two cyclists passing us. It was a young couple, the woman on a road bike and the man on a recumbent hand powered bike. They stopped in the lay-by just above ours so Shirley took the dogs for a leg stretch and went up to meet them. They told her that they’d done the same route a few years before in driving rain so they were grateful for the sunshine. The young man had very little use of his legs but his arms must have been incredibly strong – these hillsides are not for the faint hearted. Even Holly the motorhome has grumbled a few times and she’s got 3litres of grunt. Next stop for us was Lochinver. This lovely little town is a bit off the route of the NC500 but it held two appeals for us. One was that it has good fishing and we’d been told that there was a suitable overnight stopover beside one of the lochs. The other was that we intended to visit Clachtoll Beach and this is the only passable way to it for a van as big as ours. Shirley bought her fishing license (£5 for a day) and we found our way to our stop for the night. .
After a long dog walk through Culag Woods that involved climbing to a viewpoint and grunting a lot, we had a good dinner before Shirley prepared to go fishing. To our amazement, as we pottered round the van, we saw our cycling fellow travellers from earlier making their way past us. As we were tucked away in the middle of nowhere this seemed an incredible coincidence. They were gone before we could react and go and congratulate them. I think they had made the journey in only about a couple of hours more than us. If you can ignore the swarms of midges, evening is a great time for fly-fishing, especially at this time of year and Shirley proved it by bringing home two lovely wild brown trout. Half way through the evening I walked along with the dogs to visit her, wearing my fabulous cocktail of Deet, Smidge and Avon Skin-so-Soft. All these things claim to keep midges at bay and I am taking no chances, having once ballooned up like a mango when a bunch of the blighters got me all at the same time. Poppy and Boo greeted Shirley like a long lost friend and created a lot of disturbance but the fish were still helpless at the sight of Shirley’s flies. Next morning, after sleeping like dead things, we drove the 6 miles to Clachtoll beach campsite. This is the longest 6 miles in the known universe as it is single track and full of blind corners and summits. We were much relieved to arrive at the site without incident and found ourselves in a busy, happy good old-fashioned campsite beside yet another lovely white sand beach. We stayed two nights and we loved it. I was amused to find that the site manager was from Leeds where I went to school. He was an absolute gem; good humoured, practical and hard working. He told us that he and his partner had come up for 6 months, 8 years ago and stayed. We keep hearing this story from people we meet on our way. People seem to fall in love with the North of Scotland and end up staying permanently. We love it here but not enough to take such a drastic step. I had no idea, until we did this trip, that there were still such massive areas with almost nothing on them, except a few lonely crofts. People drive miles on single-track roads to shop in a small Spar shop. There they buy whatever is available on the day – choice is for the townies. Even more surprising has been the discovery that the Co-op on the Isle of Tiree, where we began our trip, is far, far bigger and better stocked than any shop we have found north west of Ullapool. We started our trip there and thought it was remote. Now we realise it’s a bustling community. Travelling has changed our view of the world. While we were out for a walk near Clachtoll Beach we met another pair of cyclists. They were a mature couple and were pushing their bikes up a steep hill right into a 25 mph north easterly. We were coming down the hill at speed only possible with that kind of tail wind but we managed to come to an ungainly stop and pass the time of day with them. “Another lovely day!” shouted the man over the gale. I couldn’t reply because the wind had taken my breath away and also because I couldn’t quite believe how cheery he was when his bare knees were chapped and red raw. His wife said nothing but managed a wan smile. The next night, having made the trip over the mountains right in the north-most north west of the mainland and made it to Durness we were astounded to see the same couple in the pub. Yes! Our current campsite has a pub next door and we were so excited that we went straight in there, having only stopped to admire the beach and plug in the electric cable. So the lady of the wan smile came over to chat to us in the pub and admitted that she was exhausted. We asked if they were staying the night here in this admirable watering hole and all round beautiful place. “Oh no,” she responded sadly, “we have to get to Tongue tonight.” That’s another 30 miles on from here and, dear sakes, a few minutes later the heavens opened and an icy downpour blew in on that north easterly cold wind. You really can take this adventuring too far you know. So here we are in Durness and it has much to recommend it. This morning, having taken advice from our pal Mary, we went to the Cocoa Mountain, a café specialising in chocolate. Oh my goodness! We were in heaven. Really. You have to drive the several hundred miles to get here and try it. But bring plenty money. It’s expensive but in that way that is worth every penny. Go on, you know you want to. People watching is our thing. We can’t help it and it gives us loads of entertainment, so we thought we should share some things we have noticed about our fellow travellers. It matters not one jot what you wear as you do the North Coast 500. No-one gives a stuff. We have seen just about every form of strange attire known to man. On any given day you will see everything from a person sunbathing on a beach in trunks when it is only 11c and a north easterly wind is blowing, to people in shorts, t-shirts and sandals and on the very same day someone wearing a hat with flaps over their ears, two coats, fur lined boots and massive gloves. We can only assume that the sunbather is from Newcastle, the man in shorts is a local and the one wearing every item of clothing they own is from somewhere in the Med. There is a certain group of older man we have particularly noticed and they fall under the title of “ones who shop in the ridiculous hat shop”. They wear hats made of tapestry with tassels, large floppy brimmed creations, crocheted tea cosies and ones that appear to be made out of their granny’s stair carpet. Gentlemen – this is not a good look. Get a grip. I’ll have you know that I love that stair carpet hat, so there. ??? Thanks for bringing back wonderful memories of the many trips I’ve had to this area over the years. My most recent was three years when I drove from Brora across to Ullapool during which I stopped many times in awe to photograph the ever changing views of Suilven, in my opinion the most stunning mountain in Scotland. As I no longer live in Scotland I can’t visit as often as I’d like. You’re blog is inspiring us as we save for our first motorhome! Cocoa Mountain has a franchise at Auchterarder. No beach or dramatic mountain scenery though. Loving your travellers’ tales, gals! Bex and I had a similar experience of almost getting onto a ferry by mistake; we were in Sardinia and trying to head for the airport but thanks to appalling road signage (that’s my excuse, anyway) we somehow ended up in a four-lane queue for the ferry to Corsica. I’m not sure that the car rental people would have been too happy about collecting the vehicle from another country…! Really enjoying your posts on Scotland. 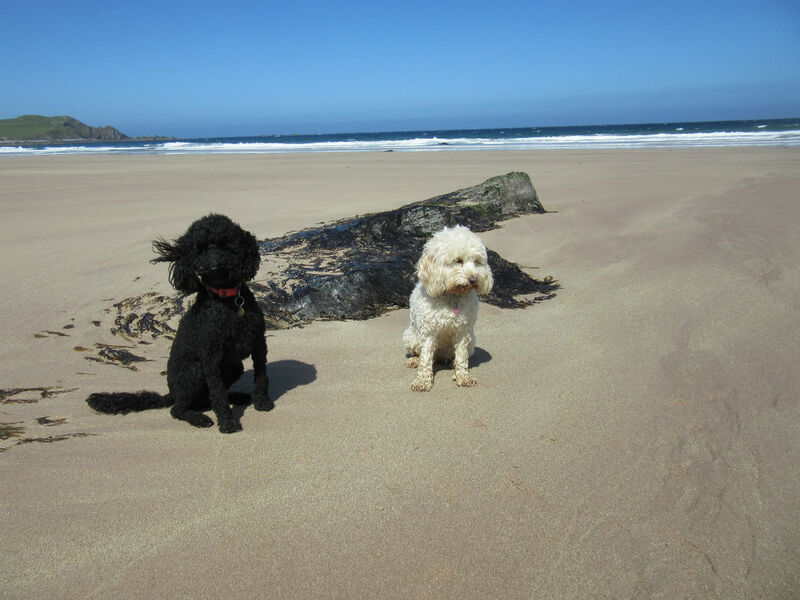 We did our first motorhome trip this Easter going to some of the same places but no further than Gairloch – loved Arisaig! Your weather looks much better but we have to stick to scholl holidays until I retire in a couple of years or so. Can you tell me what camera you are using? I want to buy something for our trip this summer. Looking forward to more tales from your trip. Hi Liz, We’re using a Canon Bridge Camera and occasionally a Canon compact. They’re both a few years old so the actual models probably aren’t available now but we find them both excellent. Arisaig is the warmest place in Britain today – not so much up here in Durness. Glad you like the blog.